give me a break.. Superbowl just ended a few hours ago and i have been partaking but my account was just activated today so here I am. don't own a race horse, never owned a race horse. probably dumb enough to breed one and see what happens. so if I can work everything correctly we are going to give 4 different options with the same mare and see where things lead. If you could formulate questions I would be happy to try to help you out - those links bombed my browser and I'm not sure what you are seeking. If you are seeking stallion selection suggestions. you could provide the name of the mare you have along with the location/region you are breeding in. It helps to narrow down the data to look at since if you have an Ohio registered mare, for example, you are not seeking the name of the "perfect" match that might be standing in California. Sorry if it was unkind to your computer, was just supposed to be images and I should have inserted them as images instead of links. I'm a stock broker. Local banker has some nags and on most of them he is the listed trainer. He only trains his own and it really isn't a money making proposition. He says some guys golf, some guys fish and neither of them make any money at it, he just likes to run horses. I'm starting to think it is a personality disorder. As is normally the case we argue, but while I lead out his horses to be ponied (it's where I drink beer) I'm trying to learn some methods to analyze his upcoming breeding season. I halfway think he was just screwing with me when he asked because some of us stock brokers might have a little OCD and in the bad month of Dec, I spent a few hours on it. Of course I had to analyze some of the cost structure. My banker friend brings them in on a trailer to race. He doesn't keep any stalls at a track. He is his own listed trainer so he doesn't incur that fee. He basically acts has his own groom at the barn and goes and picks up his own hay and feed. His cost structure per day is considerably less than average. But we are in way Southern Illinois. Five some hours from Arlington, 4 some from Turfway and 9+ from Fairgrounds. I wouldn't say the horses are going to be running at Churchill any time soon. Oh, if anyone wants to look this up, take any Canadian Frontier mare and use that. Canadian Frontier has really only had Hilda's Passion that birthed Yoshida that has done worth much so far. 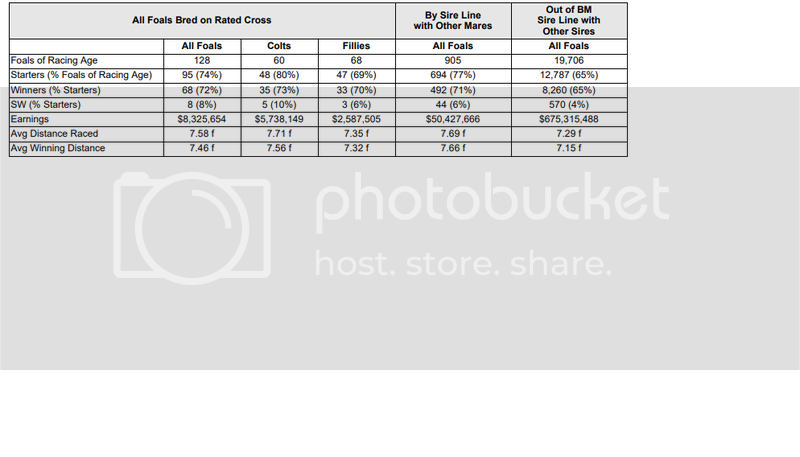 Surprisingly, take any Canadian Frontier mare; true nicks it with the three studs mentioned then divide the total winnings by the total number of foals (not just the starters) and I'm pretty sure the one without any graded stakes winner has the highest average. 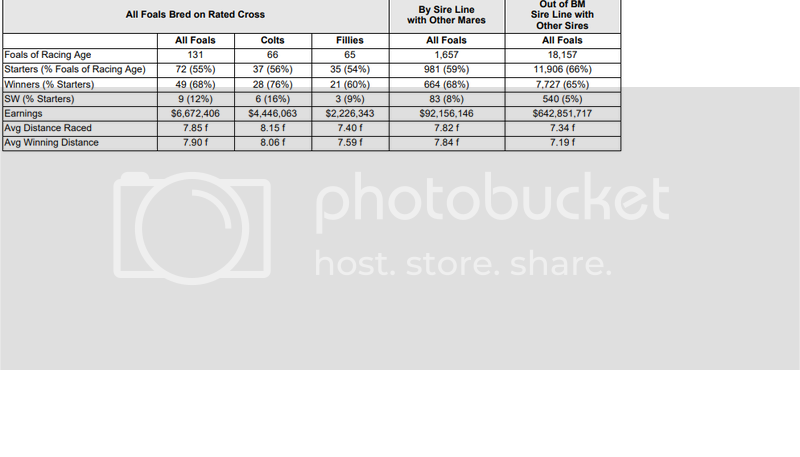 Then the split the difference and then the half that come out starters but a bunch of those are graded stakes winners have the next best income to total foals averages. Initially I thought take the surest option to at least break even and any money on top of that was gravy. Problem is if I ever had drop it a class and it got claimed I'd most likely lose. And he finally explained it in terms I understood. He said it took his accountant a few years, but finally the account said "oh , i see now; your investment in horses are like penny stocks, Lose on most but make real money on a few" He told me if I really ever thought about investing in horses the thing to do was buy shares in 4 totaling the same investment I might have in one and hope one of them hits. The chances of me being able to breed one single horse and make money wasn't as near as high as I and most people think no matter how many hours we spend crunching numbers. So I probably don't see myself doing this. There is some other analysis to do (there always is). 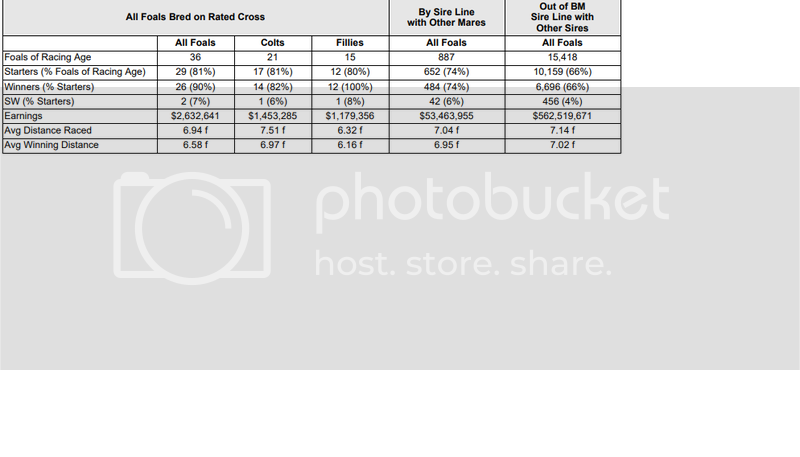 In the last ten years Illinois bred / foaled / owned , has freaking tanked. We got a new Governor with a change in party so some of the local people are hoping for a turn around, though I wouldn't bet on it. Also one of the split the difference studs I looked at was in Indiana and currently they have a nice state program. In baseball parlance, I am the front office nerd. Never played the game, just know a lot about numbers. Don't like the idea of the flavor of the month 'commercial' studs, just paying a baseball player way to much for what is probably going to be a bad contract. And as a guy than only looked at numbers , confirmation was never ever a consideration. If I thought it could run with 5 legs and looked like a Appaloosa got on top of a Palomino, I don't really care. Welcome to the query board. Your post provides great insight into your request. It is only natural that both a stockbroker AND a banker would gravitate toward the mathematical and statistical data for sire selection! And, in my opinion, if breeding was that simple every A++ nick out there would be a stakes horse. Nonetheless the data can be very useful. I have been analysing pedigrees for upwards of 20 years and have selected stallions for a few clients that resulted in winners. I believe it is important to "nick" the whole pedigree on a mare, not just the sire line over the sire line, which is what those programs all do. I research what has worked with the mare's family in the past and include that in the overall process of stallion selection. The mare contributes more than the 50% DNA since she provides the mitochondrial DNA which is only passed through females. Therefore she got it from her dam, who got it from her dam, etc. up the line. The mare family is an important component. Also, at a professional analyzer of linear data (I mean this in a very kindly sense please don't take offense) you dismiss conformation as a factor. Be advised there are no "five legged horses that look like an Appaloosa on top" showing up in the winner's circle anywhere. I've encountered many a regally bred mare that was, essentially, a rat, and no matter the stakes horses her dam produced, her sire produced, etc. she was still a rat and generally only threw rats, even when bred to the very best stallions in the world. I know one in particular that had over $1.5 million spent breeding and of her 9 foals, her only winner was by a $1K stud fee south American horse who stood in Arkansas that she produced near the end of her career. And that one was a low level claimer with a bleeding problem. Perhaps you will agree that, economies aside, it costs just as much to breed, foal, feed, raise and train a good horse as it does a worthless one. No matter how modest your budget might be you still really want the biggest bang for the buck. So for your purposes it might be important to start with a mare who had talent. One that has at least won and gone through her conditions. Soundness is also important since the lack of it, regardless of talent, costs a lot of money and time during a race career. Due to your location and the type of training and racing your friend participates in, versatility will also be KEY since you will most likely compete on dirt, turf, AND polytrack. These are also all factors that come into play. As I said, I would be happy to take a look at matings for you - I would really need the mare's name, though. You could send me a private message with that if you feel the need for confidentiality. Again, welcome to the board. You will find a wealth of information here.